Sherrie Scraps with passion: PDE Linky Party Challenge~Have a WILD WILD Birthday! PDE Linky Party Challenge~Have a WILD WILD Birthday! 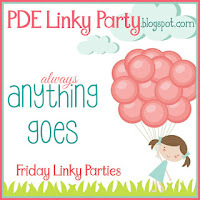 It's time for another new PDE Linky Party challenge. The challenge starts each week on Friday and the theme is "Anything Goes". SO, please come link up what you've been working on. We'd love to see your creations :) I hope you have a fantastic day! I have a fun birthday card and treat box to share today with you~ . 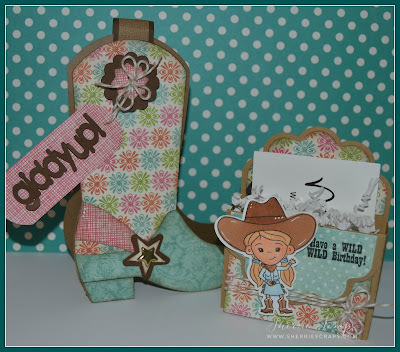 The boot shaped swing card is from the Silhouette Store and cut on my Cameo. The fun pattern papers are My Minds Eye~Ooh La La Collection. I did some distressing along the edges with Tim Holtz walnut stain. The cute treat box is created with Jaded Blossoms Scallop Caddy Die. The adorable little cow girl and sentiment are from Pretty Cute Stamps~Howdy Partner stamp set. Make sure you stop by and check out what the Design Team has made for some inspiration and then come back and join in! OMYGOSH!!!! These are ADORABLE!!! And those are the perfect papers for them!!!! LOVE LOVE LOVE LOVE this set!!!!!!!!!!!!!!!!!!!! Adorable, Sherrie wonderful papers for these. What a cute and fun gift set. I love the boot shaped card and little cowgirl on the treat box. Oh my gosh, these are so fun, Sherrie!! I love the boot-shaped card!! The papers you used are just perfect!! And the treat box is so sweet!! She's adorable!! I love, love these!! Someone is going to be very happy receiving these!! Love, love them my friend!! Thanks so much for playing along at DL.ART!! Sherrie ~ these are both so adorable! 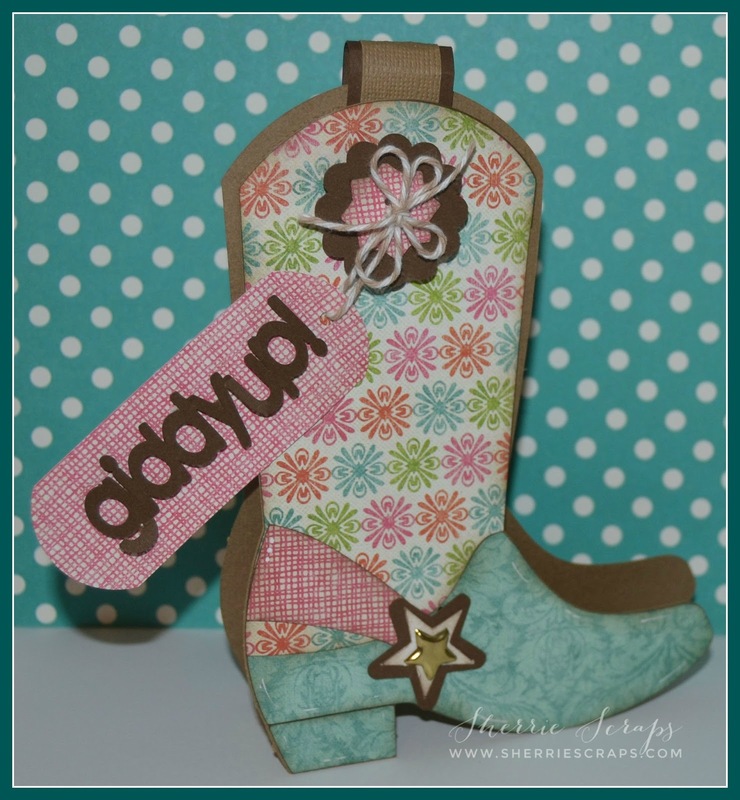 I love the boot shaped card and the papers you used are perfect for it! The treat box is so cute! Who wouldn't love to get this! Thanks for playing along with us at DL.ART May Linky Challenge! This is such a super sweet gift set! LOOVE that MME paper and that adorable digi! The Boot card is so CUTE! And I have that file too - really should pull it up to make a cute card like you did! :) Have a great weekend! HUGS! Such a fabulous treat box and card set! The boot shaped card looks so amazing! You have selected the most beautiful colors and patterns for your set! Hope you have a fabulous weekend! What a cute set! Love the sweet treat box and the awesome card. Beautiful papers too! Oh my Gosh! This is absolutely AWESOME! I LOVE that boot! The paper collection is gorgeous as ever, what a great project duo!!! Oh my goodness..such a fun set! !I absolutely love the cool boot shaped card. Fabulous! The treat box is so sweet and such a darling image. I think the DP is gorgeous. This is Awesome my friend! OMG What a wonderful set!!! Love the papers and that adorable image!!!! Have a great day. These are sooo cute!!! I love the papers you used. This is such a FUN set, Sherrie! Your papers are fabulous and that sweet little cowgirl is adorable!! 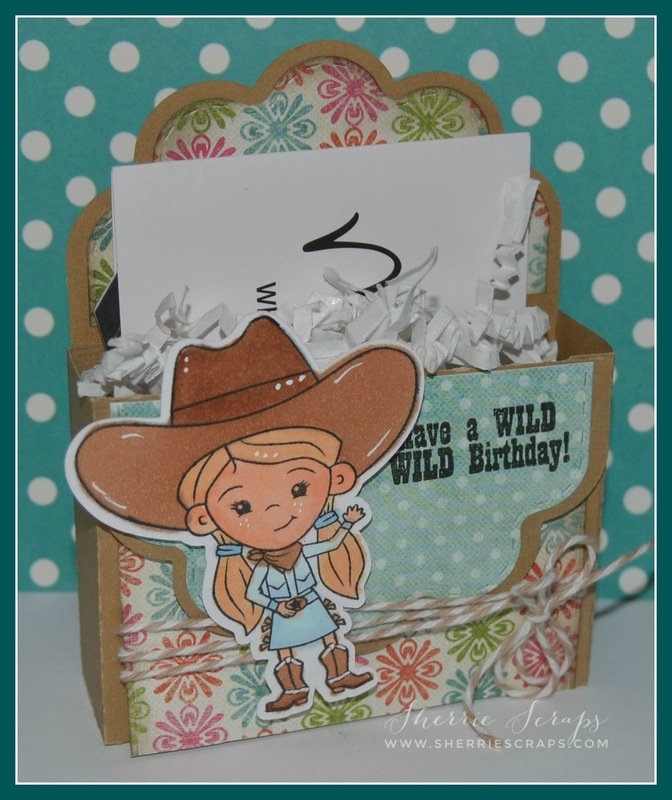 What a fun cowgirl card and treat box! They are adorable! Oh Sherrie these project are adorable and fun!! Thank you for joining us over at Decorate to Celebrate!! Okay, I absolutely adore this cute set! My granddaughter is all about anything western or horse related and this just reminds me of her. 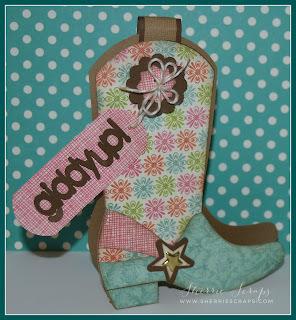 That boot is fabulous and I love the papers you used. And, how cute is that little cowgirl?! This is awesome! Yeehawwww! These projects are so cute!